Kevin Smith Transportation Group is a Limousine and Corporate Transportation company that delivers services to individuals and companies across the Greater Philadelphia, PA area. Within the 6 area counties, which include Berks, Bucks, Chester, Delaware, Montgomery and Philadelphia, are more than 300 cities, boroughs, towns and townships that KSTG services. 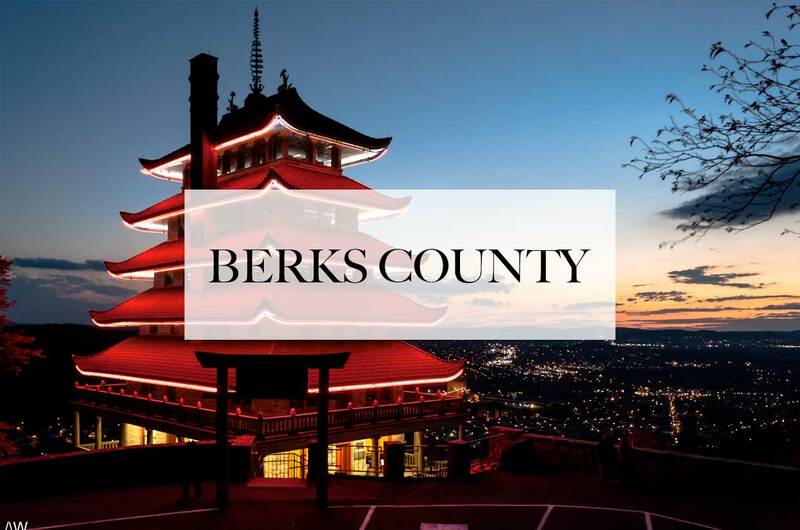 One of our more frequent communities that we service is Berks County, PA.
Berks County, PA is located east of Montgomery County, PA. The approximate population is 415,271. The county seat is Reading, PA. Reading, PA developed during the 1740s when the inhabitants of northern Lancaster County sent several petitions requesting that a separate county be established. With the help of German immigrant Conrad Weiser, the county was formed on March 11, 1752 from parts of Chester County, Lancaster County, and Philadelphia County. It was named after the English county in which William Penn‘s family home was from. Berkshire, which is often abbreviated to Berks. Berks County began much larger than it is today. The northwestern parts of the county went to the founding of Northumberland County in 1772 and Schuylkill County in 1811, when it reached its current size. In 2005, Berks County was added to the Delaware Valley Planning Area due to a fast-growing population and close proximity to the other counties in the area. Birdsboro, PA is a borough in Berks County, PA. Located along the Schuylkill River, it is 8 miles southeast of Reading, PA. Birdsboro, PA estimated population of is 5,163. In the past, Birdsboro, PA was noted for its large foundries and machine shops, none of which remain in operation today. Boyertown, PA is a borough in Berks County, PA. Located along the southeastern border of Berks County, PA, Boyertown, PA was named after its founders, brothers Henry and Daniel Boyer. Boyertown, PA’s estimated population is 4,055. Kenhorst, PA is a borough in Berks County, PA. Located in central Berks County, PA, it is bordered by Reading, PA to the north and east and by Cumru Township, PA to the south and west. Kenhorst, PA’s estimated population is 2,877. Mohnton, PA is a borough in Berks County, PA. Located in southern Berks County, PA, Wyomissing Creek flows through the center of Mohnton, PA. Their first post office was formed back in 1857. Today, it is estimated that 3,043 people live in Mohnton, PA.
Shillington, PA is a borough in Berks County, PA. It is located in the suburbs of Reading, PA. Shillington, PA is best known for being the location where Pennsylvania’s first Governor, Thomas Mifflin, is from. Today, it is estimated that 5,273 people live in Shillington, PA. Sinking Spring, PA is a borough in Berks County, PA. Sinking Spring was given its name for a spring located in the center of town. The water in this spring would sink into the ground from time to time, giving the illusion that it had disappeared. Today, it is estimated that 4,008 people live in Sinking Spring, PA.
St. Lawrence, PA is a borough in Berks County, PA. Located in south-central Berks County, PA, the population is estimated at 1,809. Wyomissing, PA is a borough in Berks County, PA. The population growth of the borough was largely due to its merger in January 2002 with neighboring Wyomissing Hills. Wyomissing, PA is the most populous borough in Berks County, PA. The borough was selected as a “Contender” for the best places to live in Pennsylvania by Money magazine. Today, it is estimated that 10,461 people live in Wyomissing, PA.
Kevin Smith Transportation Group fleet of vehicles deliver both Leisure and Corporate services in Berks County, PA. On the leisure side, a KSTG Wedding Limo or Wedding Party Bus are out every weekend moving everyone from Brides and Grooms to everyone in attendance at the wedding. Wedding Shuttles have become very popular in Berks County, PA as Brides and Grooms become tasked with making sure everyone can travel safely from the hotel to the venue and back. Additionally, calls for a Birthday Limo or Birthday Party Bus are common in Berks County, PA and are also a great way to celebrate a Night on the Town. For some people who are looking to attend a concert or show in Philadelphia, PA, sending the perfect Party Bus to Berks County, PA to handle all of the transportation is a great way to celebrate your night out. Sometimes, the Party Bus or Limo is used to get the party started, like for those headed to the Manhattan Cruise Terminal or a local airport, where Berks County, PA is only the starting point for an amazing trip. Berks County, PA is comprised of 44 townships, many offering amazing school districts, social venues and great communities to raise a family. Here is a list of the top 10 townships (plus one) that make Berks County, PA such an amazing place to live. Amity Township is a township in Berks County, PA. The population is estimated at 12,583. Amity Township, PA, especially in the Douglassville area, is seeing extensive growth in development. Amity Township, PA was so named for the cordial relationship, or amity, between Swedish settlers and the local Native Americans. Brecknock Township, PA is a township in Berks County, PA. Brecknock Township, PA was named by Welsh settlers after their homeland, Brecknock, in Wales. The population of Brecknock Township, PA is estimated at 4,585. Caernarvon Township, PA is a township in Berks County, PA. The population is estimated at 4,006. Caernarvon Township, PA is often referred to as Morgantown, PA, the township’s largest village. Cumru Township, PA is a township in Berks County, PA. The population is estimated at 15,147. Nolde Forest Environmental Education Center, a Pennsylvania state park, is located in Cumru Township, PA. Many companies in Berks County, PA have been pushed by their Senior Management or Counsel’s office to follow strict Duty of Care requirements with their employees. This means that the days of using an unregulated Black Car Service for Corporate Transportation services is no longer allowed. For Kevin Smith Transportation Group, this means that their Black Car Service division, including our fleet of Cadillac XTS’s, Black Yukons and Black Infiniti’s, are regular visitors to Berks County, PA.
Douglass Township, PA is a township in Berks County, PA. Douglass Township, PA has 2 sites on the National Register of Historic Places. The Ironstone Bridge and Pine Forge Mansion and Industrial Site. Today, they estimate the population of Douglas Township, PA 3,306. Exeter Township, PA is a township in Berks County, PA. The population is estimated at 25,550. Exeter Township, PA is the third most populous municipality in Berks County, PA after the city of Reading, PA and Spring Township, PA. Betsy King, the famous female golfer, is a notable athlete who grew up there. Lower Alsace Township, PA is a township in Berks County, PA. It is the smallest township in square footage of any township in Berks County, PA. Today, they estimate the population of Lower Alsace Township, PA at 4,475. Robeson Township, PA is a township in Berks County, PA. Robeson Township, PA is named for Andrew Robeson, an early settler. County records estimate the population of Robeson Township, PA at 7,216. Spring Township, PA is a township in Berks County, PA. With an estimated population of 27,119, it is the second most populous municipality in Berks County, PA after the city of Reading, PA.
Union Township, PA is a township in Berks County, PA. There are 4 places in Union Township, PA that are on the National Register of Historic Places including French Creek State Park. f you are fortunate enough to work for one of the amazing companies in Berks County, PA, then you may require the services of Kevin Smith Transportation Group and our Corporate Transportation division. Airport Transportation is a common service request with Philadelphia International Airport (PHL) and Lehigh Valley International Airport (ABE) located so close to Berks County, PA. However, with nearly a dozen International Airports in the Mid-Atlantic area, many companies will utilize KSTG’s services for Airport Transportation to Newark international (EWR), Kennedy Airport (JFK) or other points north or south of the Philadelphia, PA area. Other Corporate Transportation services that Kevin Smith Transportation Group offers companies in Berks County, PA include Shuttle Services. This may be needed for moving employees to local train stations for both their morning commute and returning home in the evening. KSTG Sprinters and Mini Buses are popular vehicles for this service. Some companies, with offices or clients around the country, often have employees traveling through local FBO’s. When Private Aviation is utilized, KSTG Cadillac XTS’s and Black Yukon’s are often seen transferring employees from their offices in Berks County, PA to those local FBO’s including Reading Regional Airport, Northeast Philadelphia Airport and Wings Field. With more than 70 cities located across Berks County, PA, many leading corporations have landed their headquarters in Berks County, PA to take advantage of the strong workforce available across the county. The largest city in Berks County, PA is Reading, PA.
Reading, PA is a city in and the county seat of Berks County, PA. With a population of 87,575, it is the fifth-largest city in Pennsylvania. Located in the southeastern part of the state, it is the principal city of the Greater Reading Area. The city, approximately halfway between Philadelphia, PA and the state capital at Harrisburg, PA, is strategically situated along a major transportation route from Central to Eastern Pennsylvania, and lent its name to the now-defunct Reading Railroad, which transported anthracite coal from the Pennsylvania Coal Region to the eastern United States via the Port of Philadelphia. Reading Railroad is one of the four railroad properties in the classic United States version of the Monopoly board game. Reading, PA was one of the first localities where outlet shopping became a tourist industry. It has been known as “The Pretzel City”, because of numerous local pretzel bakeries. Currently, Bachman, Dieffenbach, Tom Sturgis, and Unique Pretzel bakeries call the Reading, PA area home. The entire team at Kevin Smith Transportation Group is proud of our partnership with every company, venue and person from Berks County, PA who chooses KSTG as their #1 Transportation Company. We believe our priorities around luxury makes our service the industries best for everything from a once in a lifetime Wedding celebration to supporting our Corporate clients who require use of our Shuttles and Sprinters for a company event. With Berks County, PA and KSTG working together, we are confident KSTG vehicles will continue to support the entire area for years to come.